The Who, What, Where, When, How and Why of a webpage. Usability factors of a website are its activities, actions and operations. Can a user easily gather information, is the site user friendly, can the user build a relationship with the website? Here is what I found in my website analysis while applying Burke’s rhetorical pentad. 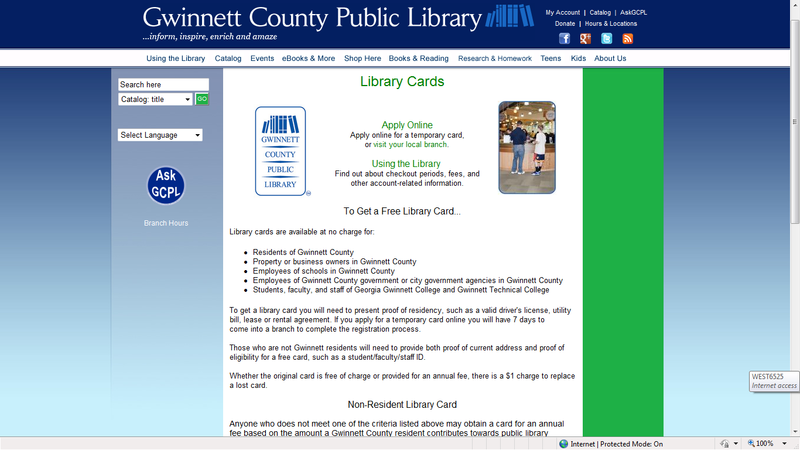 The Gwinnett County Public Library website is the digital equivalent of a branch’s help desk, open 24/7. The library system includes the web address on a customer’s library card, printed checkout receipts, promotional flyers and bookmarks. New users can find the website by searching the web using the terms: Gwinnett County Public Library, Gwinnett Library, Lawrenceville Library Ga or by the acronym GCPL. Please note that when using the acronym the user will actually locate two public libray systems. 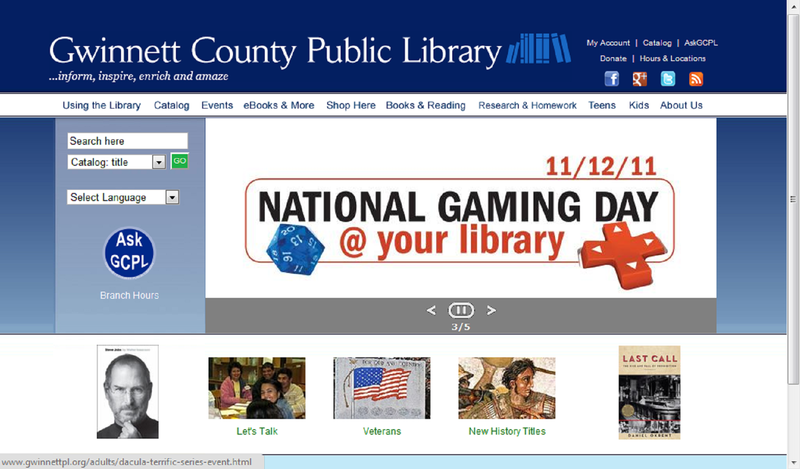 The Greene County Public Library is the first hit in Google, the Gwinnett County Public Library is the second, third and fourth entry online. Users come to the library website for a variety of reasons. Some come to enhance their knowledge base, others to be part of a unique community. New users locate the website and explore all the library has to offer; both online and in the branches. A few users will even critique the system, occasionally offering solutions to perceived problems. Users can locate material within the library system, review personal account information, research information from databases, apply for library cards, communicate with library staff, locate program dates and time. Informational links pertaining to the public school system, local government agencies and genealogy are also available. The website is very clean in design, with clearly labeled areas of interest. The information on the webpage is presented in plain English, no library jargon is present on the homepage. The website is broken into frames and the use of whitespace encourages the user’s eye to follow the text from left to right. The information is presented in a orderly fashion keeping a new user from becoming overwhelmed. Hyperlinks can be quickly accessed by running the computer mouse over the area, causing the arrow to change to the pointing hand icon. Ways to follow the library on social media platforms like Google+ and Facebook are available from the homepage. These icons are conviently located near a set of frequently used hyperlinks, giving the frequent user a virtual “one stop shopping” area. Recognizing the diverse cultural community in Gwinnett county the library has provided a variety of languages that the webpages can be translated into. Featured prominently on the page is a current events flash slideshow. Users have the option to pause the slideshow by clicking on the photo of interest and more information will be made available. 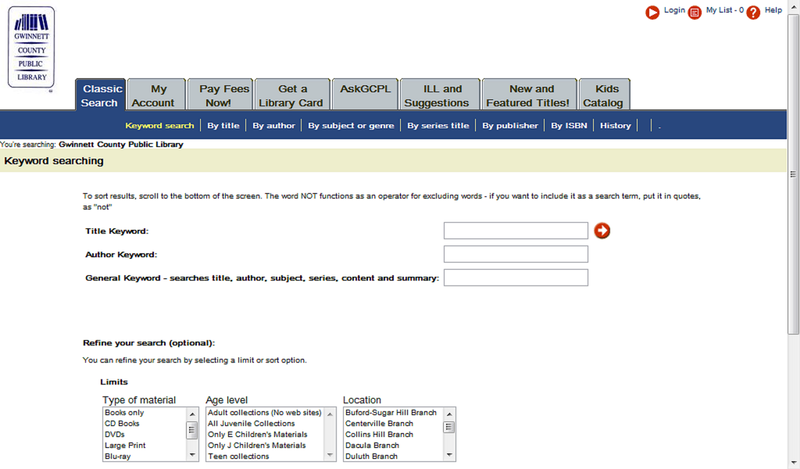 If a user is looking for a book there are two designated areas for searching on the website. Without leaving the homepage a user can search for a title in the search box conveniently labeled “Search here”. The other option is to click on the hyperlink labeled “Catalog”. This link will take the user to the system wide search engine. To accomplish most of these activities a customer must know their 14 digit library card number and 4 digit personal i.d. number to log into their account. By logging into their personal account the user is developing a relationship with the library and it’s website. This relationship is a reciprocal one in that the user has the opportunity to interact with the site via the catalog , IM and email services, online fee payment. In return the customer receives from the library requested material, responses to queries sent by customer, and access to research material. A new library user has the opportunity to apply online for a library card by filling out the form provided when the user locates the form under the “Using the Library” link on the homepage. On the catalog page ther is a gray tab labeled “Get a Library Card” that links to the form too. The website does expect the users to have certain web browsing skills, like knowing to role over hyperlinks, overall it is very user friendly.